Instructions: The finished card size measures 7 inches by 5 inches. To make the card base, cut white card in 10 inches by 7 inches and score at 5 inches mark on the longer side. Fold to make a card base. Distress the edges of the card base with Distress ink. Cut a 6 3/4 inches by 4 3/4 inches pattern paper design from the paper collection and adhere to card front using clear glue. Cut two pieces of die cuts from Petite pockets die set. Adhere the two together with glue as shown. Cut a pattern paper 4 3/4 inches by 5 1/2inches. Distress the edges with Distress ink. Adhere the die cuts to this as shown. Adhere the whole piece on the card front with foam tape. Stamp the Pansy frame image on white card stock. Colour with Zig markers and cut with coordinating die. Cut the small lattice die cut from Lacy Diamond die and adhere to the centre of pansy frame. Cut an A2 card frame from pattern paper. 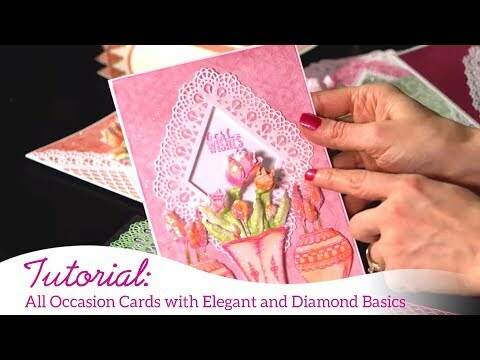 Add the lace die cut on top from the Decorative die set. Adhere the Pansy frame on this panel and adhere to the card. Cut a small diamond diecut. Cut a sentiment from pattern paper and add to the card to finish it.